Recently I made a tutorial on how to make Android apps if you don’t have any programming experience. I hope I’m not ruining the secret, but all along I’m actually teaching how to make Java Android apps and by the end you’ll be surprised by how easy making Android apps is. In these videos we make apps that quickly teach you many of the capabilities of a tool called App Inventor. We make professional weather and paint apps. We cover how to parse JSON, work with databases and PHP code on your server. I hope you enjoy it. 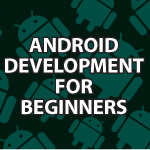 Android Development for Beginners : I’ll cover how to install App Inventor and then use it to make an app that uses GPS, Opens Dialog Boxes, Opens other apps, vibrates devices, plays sounds, converts text to speech, uses the accelerometer, adapts to screen orientation and more. Android for Beginners 2 : I cover Location Sensor, global variables, changing label text, working with strings, Sound, Buttons, Event Handling, Text to Speech, Vibration, Accelerometers, Orientation changes, Dialog boxes, executing activities, and so much more. Android for Beginners 3 : I’ll spend a lot of time showing how to use the App Inventor ActivityStarter. We’ll see how to open other App Inventor apps, browsers, email, Google Maps, YouTube and more. I’ll also cover using lists, event handling, sliders, notifier, check boxes and much more. Android for Beginners 4 : I’ll continue to cover event handling, sliders, and notifier. I’ll also cover how to open other App Inventor apps, browsers, email, Google Maps, YouTube and more. Android for Beginners 5 : I make an app that grabs weather map data dynamically and displays it. I also make an app that shows how to use the camera, image picker and TinyDB with App Inventor. All together I show how to display images from the internet, take pictures, retrieve images from the gallery, store pictures in TinyDB, resize your app to fit any device and more. Android for Beginners 6 : I decided to make an Android Beat Box App. It could also be converted into a voice note app, or anything else that would benefit from being able to record and later play back sounds. I’ll specifically cover how to use the Android SoundRecorder, Player, take another look at using list, teach more about logic and incremental programming. Android for Beginners 7 : In this tutorial I’ll show you most of what you need to know for drawing Android buttons for your interfaces. I’ll be using a free program called Inkscape to draw 6 buttons. Android for Beginners 8 : I’ll show you how to make an Android toolbar and then show how to switch between screens in App Inventor. Android for Beginners 9 : This is the first video in a series in which we will make a professional weather app for Android. In this video I will show how to parse JSON Data with App Inventor. I also cover the App Inventor Web component, using Location Sensor, converting JSON data into an App Inventor List and much more. Android for Beginners 10 : In this tutorial I’ll walk you step-by-step through the process of using App Inventor to Parse JSON data. I’ll pull JSON weather data from Weather.gov and show how App Inventor organizes that data. I’ll then pull in specific data that we will use to create our Android weather app. I’ll also show you how to add padding to components in App Inventor. Android for Beginners 11 : I will start covering Android interface design. I want the weather app we have been creating in parts 9 and 10 of this series to look very nice. Here I’ll show you how I created the layout and I’ll also walk you through the techniques needed to draw all of your icons in Inkscape. Android for Beginners 12 : I’ll focus on creating App Inventor interfaces. I’ll take the vector art I made in the last tutorial and convert it into a App Inventor interface. I create regular non-App Inventor interfaces in pretty much exactly the same way. Android for Beginners 13 : I pretty much finish the Android Weather app. I cover how to create a dynamic interface, pull data from a web service, work with colors and cover logic in App Inventor. This is basically a large review of everything I have covered while making my Android Weather app in App Inventor. Android for Beginners 14 : I completely finish the Android weather app. I show how to make App Inventor wait for an operation to complete before proceeding. We also will allow the user to pull up latitude and longitude data when they enter their city and state. We use that data to pull current weather data. We teach are app to speak the weather to us. Android for Beginners 15 : I will create an Android contact app. Through making this app I will cover most everything about using Lists, List Pickers, TinyDB, TinyWebDB, Fusion Tables, and Texting. I start off simply here by focusing on creating Lists through an interface. Android for Beginners 16 : I’ll show how to share a database between multiple screens with App Inventor. One of you asked me to keep this very simple and so I will. I’ll show how to add, update and remove data from a database from multiple screens. Android for Beginners 17 : I will provide an App Inventor TinyWebDB Example. This one should be fun. We’ll be making a chat application that I call IncognitoEx. It will allow you to chat with anyone who also has the app. It allows you to send and receive messages. Android for Beginners 18 : I will provide an App Inventor Texting Example. I have been asked for the easiest way to make a texting app and this is it. The app will allow you to send texts, receive texts, and also send out an alert to the sender if you are busy. I decided to make this app right out of my head to help those people that have questions about the thought process during programming. Android for Beginners 19 : I will answer a bunch of questions. I’ll cover how to plan an application so that you can cut down on errors and have no problem with the blocks. I will also show how to make a Android contacts app that store lists of people. You’ll also store that information in a TinyWebDB. We will then be able to update lists of lists on other screens. Android for Beginners 20 : I’ll show you how to create lists of contacts, which will contain a list of information on each contact. Will save these contacts to a database online. We’ll also be able to edit it from multiple screens. After this video you’ll be able to create lists of contacts, edit contacts and delete them, with everything stored online. Android for Beginners 21 : I will provide you with an App Inventor Paint App example tutorial. I make the entire app in this one video. Specifically we’ll look at what we can do with the canvas component. It allows you to draw curves, straight lines, circles, text and text on an angle. We’ll make a palette of colors, provide for the ability to load and save files to a database. Connect App Inventor to MySQL : I want to show you how to connect App Inventor to a MySQL database using PHP. I tried to keep everything as simple as possible while at the same time teaching enough so that you can do anything. You’ll be able to submit to, update and then receive a CSV file from the database using the PHP files below. You’ll also be able to limit access to data simply by creating a different PHP file for each person that would need to access the database. App Inventor Canvas Game : I make a App Inventor canvas game. The game is a simple paddle ball game. You’ll learn about image sprites, how App Inventor animation works and all the cool built in features included with AI. With Image Sprite, Ball and Canvas you can make some pretty nice games. Convert App Inventor to Java : In the next 2 tutorials I will convert one of my most complicated App Inventor apps, being the Zombie app into a Java Android app. And, guess what? You’ll understand it. Convert App Inventor to Java 2 : I will finish up converting my App Inventor app into regular Java. Not only will we finish the app, but I’ll also show how to install Ai2LiveComplete, which is a version of App Inventor that adds a ton of additional functionality and also doesn’t require an internet connection. Sir, My name is Prakash, from Bangalore, India. I’m an MBA student. I don’t know much about programming android application, but I’m very much interested to learn and develop android apps. By watching your android development tutorial videos, I’m very much inspired because of your way of teaching. I have installed Android Eclipse along with JDK. Every options works right, but when i try to drag and drop “Text Fields” to the project, it shows the following error message. Please help me to solve this problem and to continue learning…..
Hi Prakash, Take a look at this video. It sounds like an installation problem. As the tutorial continues I cover how to create very complex layouts. Check out the videos around part 10 for an example. I want to write apps mainly to communicate with devices, maybe a camera etc. I am trying to choose between learning app inventor or android sdk. What are the limitations of app inventor over JAVA coding using the SDK? I have a feeling that app inventor might have limitations for uses like I describe above. Would love to get your expert opinion before I choose one or the other? The limits of App Inventor basically revolve around flexibility. It can do many complex things, but normally in only one specific way. If you are willing to live within those constraints you’ll be making apps quickly. If not, by the end of this tutorial series I show how to transition into regular Java Android the easy way.